System Hygiene Floor Maintenance Pads are available in 7 different colours for a variety of different uses. Each pad is engineered specifically for a particular maintenance task. 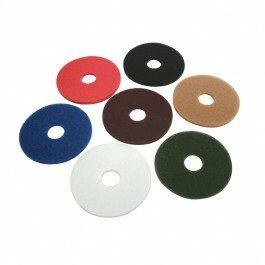 The pads are made from 100% virgin polyester and/or 100% virgin nylon fibres. Sizes are from 150mm (6") - 530mm (21") and are usable on both sides. Maroon Pads - General Spray Cleaning. Blue Pads - Heavy Spray Cleaning. Red Pads - Light Spray Cleaning. Green Pads - Wet Scrubbing. Black Pads - Wet Stripping. Tan Pads - Buffing and Polishing. White Pads - Polishing and Burnishing. Sold in cases of 5.